Tamiya M05 v2 guide, Setup, Mods, tuning and racing tips. 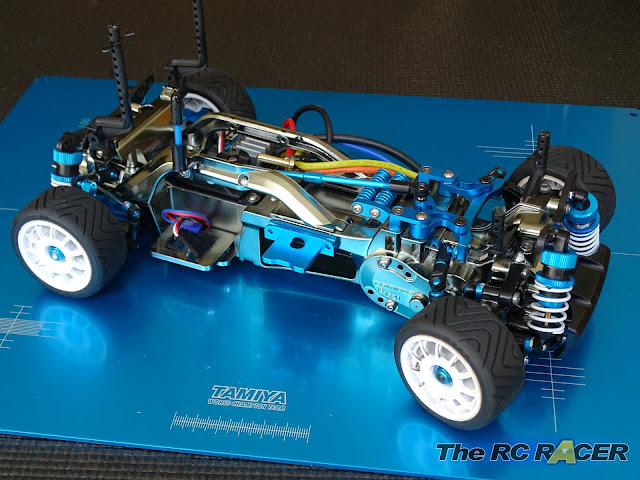 The Tamiya M-Series is probably the most popular global stock class out there. The diminutive cars are cheap, easy to maintain and fun to drive. As they are front wheel drive they stand out from you average RC car and the classic Mini shell is enough to melt even the most cynical of hearts. 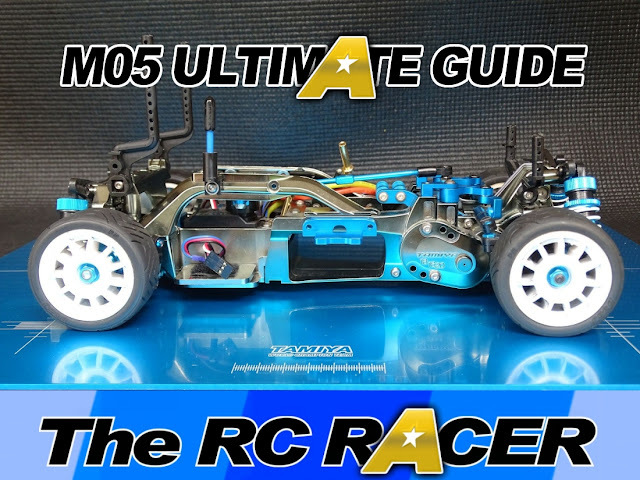 As you would expect, for such a popular chassis there are a lot of different hop-ups that are available, and there are a few tips and tricks that can help you keep your M05 leading the pack. There are a plethora of parts available for the M-05 the guide below covers a wide range of parts that myself or other RCRacer friends have used and think are worth considering to purchase when trying to get the best performance from the chassis. Although in reality just a set of bearings, oil shocks and steering posts are all that is needed to get started. This guide will be updated over time, so please feel free to contribute and check back. 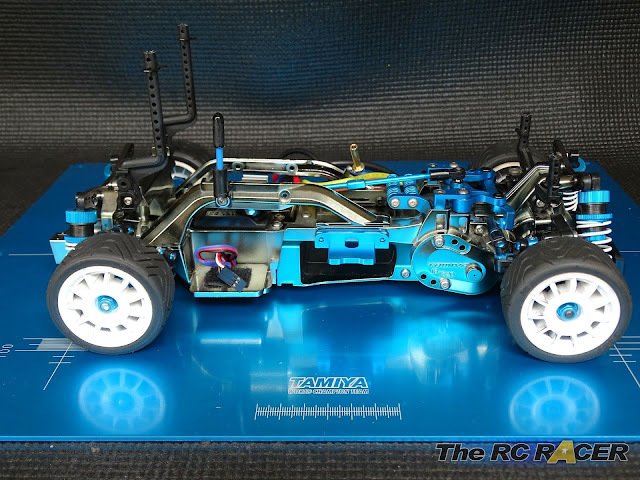 If you want a full on race M05 the king of the crop is the Tamiya 84424 M-05 V2 R Chassis kit. This is a fully loaded kit with the top hop-ups and it is much cheaper than buying the parts separately. It has most of the parts listed below, so just buy it, build it and run it. This is a limited run kit so it is not always in stock. For those who want to start cheaper and just upgrade as the go along, you can take your pick from an ever increasing range of standard M05 kits. These all come an ESC and motor. M-05 and M-05v2 What's the difference? There are two types of M-05 available. 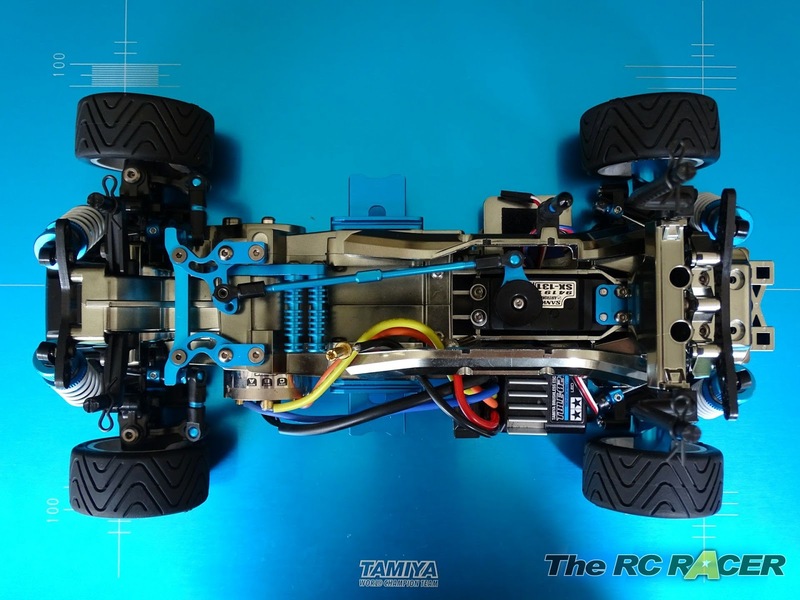 All of the kits that come with a shell are M-05, however Tamiya also sells the above two chassis kits that are M-05 v2 kits. So what is the difference between the M05 and the M05 v2? Well the original M05 has been around since 2009. There has been a slight revision in 2014 with the V2 chassis. (Click here for our detailed review). In reality both versions of the car will be fine to race, but the V2 has several advantages. 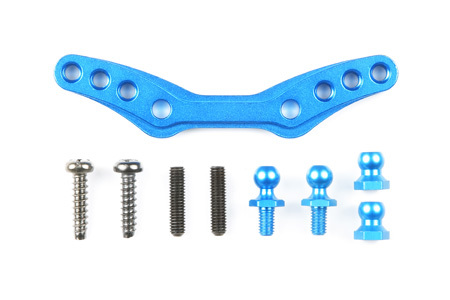 The above will give you most of the unique features of the M05v2 including the facility to set droop with a step screw, instead of adding shims into the internal shock shaft. 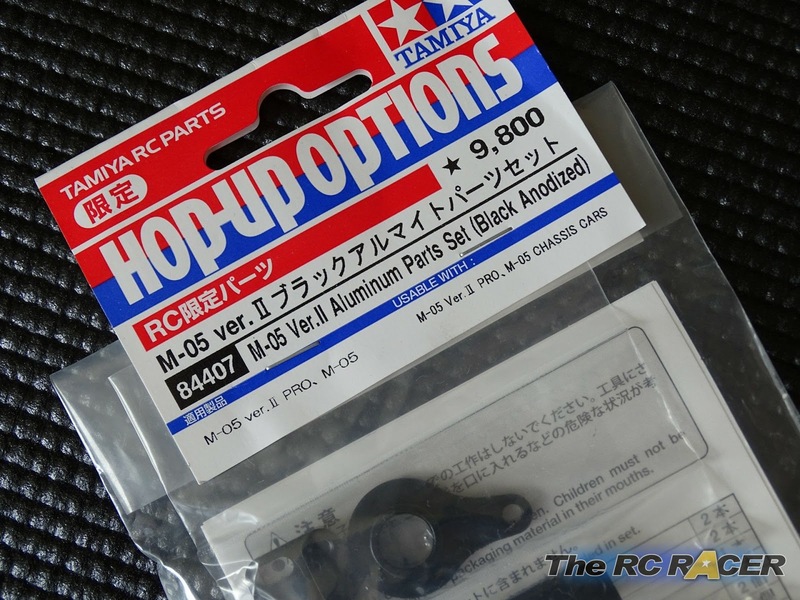 Tamiya also sells a set of key hop up aluminium parts for a M-05v2 (84407) which includes the aluminium v2 motor mount, servo mount, servo horn, steering posts, arms, rack, heat sink etc. This is a good purchase along with 54605 and 54606 if you want to convert your base M-05 to a nicely hopped up V2. 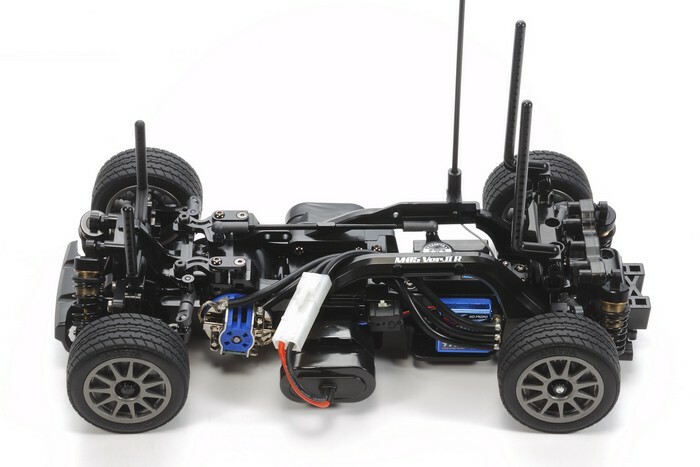 The M05 comes with the ability to have 3 different wheelbase settings. As you would expect the different length changes the way in which the chassis handles. 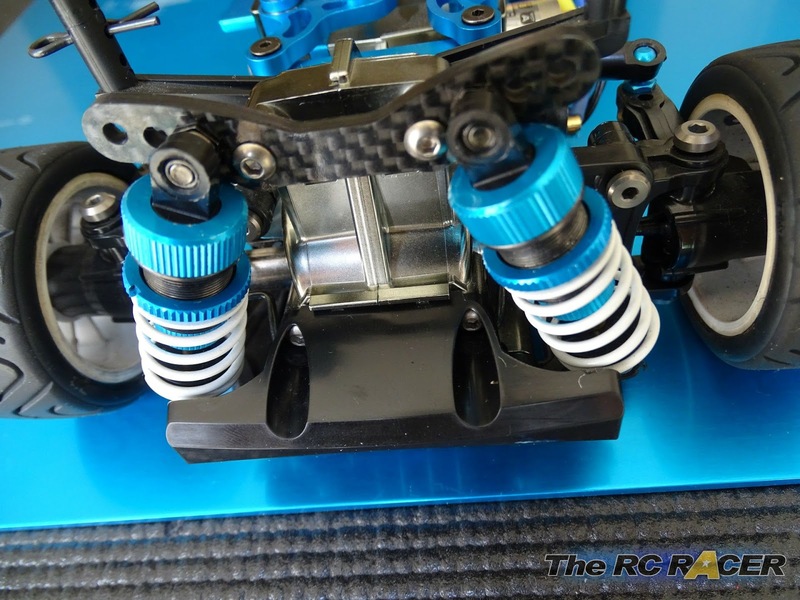 The short length chassis (210mm) is very nimble, great for small tracks, the longest chassis layout (239mm) is superb for larger open tracks as it puts more weight over the front axle giving you more grip into the corners, however it can be slow to respond quick changes of direction on the infield. The medium one (225mm) is a good compromise for overall stability, nimbleness and cornering. So for indoors I would usually go for medium, and then opt for short if it is a very tight track. For outdoors or larger medium grip indoors tracks I would consider running the long wheelbase. In reality though if just getting one shell, and wanting an easy life then medium is the way to go. So you have chosen your wheelbase, it's now time to pick a shell to pop on the top. Like any racing class the shell can help with how the car will handle, it is not as noticeable on the M05 cars as the stock speeds are usually quite low compared to other cars, but it can help you gain an edge. If you look around many of these shells also have a lightweight alternative, this will always help as the M05 cars are quite tall so taking away any vertical weight will be an advantage. There are more shells, these are the main ones and I will update the list over time. 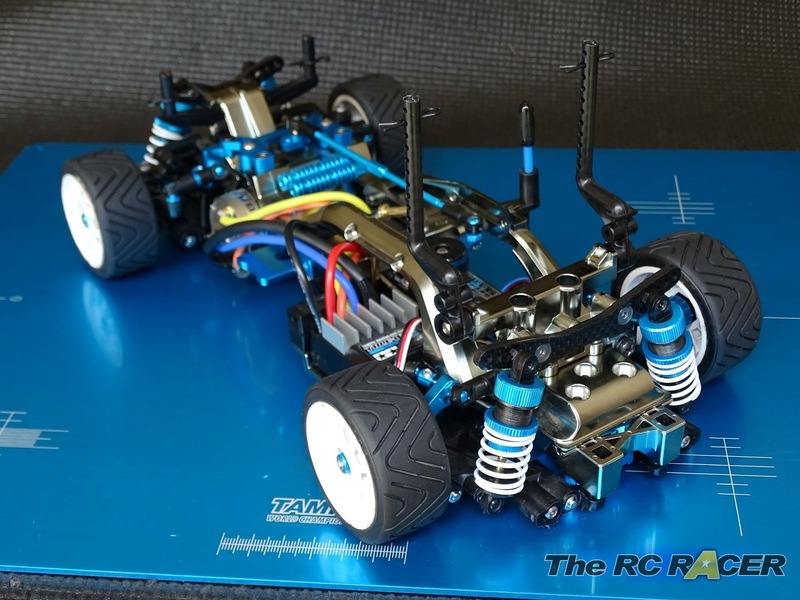 My current favourite is the Tamiya 47323 MX5 shell, the Ride BR-Z shell is also popular. There are lots of different tyres out there, and it is best to see what others at your local club run before investing in a set or two. I find the Shimizu Treaded tyres work really well at my local club which is indoor carpet. I run medium front and soft rear. This makes the car very responsive, if you want it a little easier to drive then hard front and medium rear. I also run Sweep slicks, 33 fronts and 25 rears are a good starting combo. In reality there are so many different types of tyres available you will probably be best to ask at your local club. One technique that is used a lot when racing M-05 cars is gluing the sidewall. This helps stiffen the profile of the tyre and can stop grip roll when you have tried everything else, (Softening the car etc). The M05 gearbox is not the most complex, but you still want it to be as free as possible to ensure you get the most speed from your stock motor. 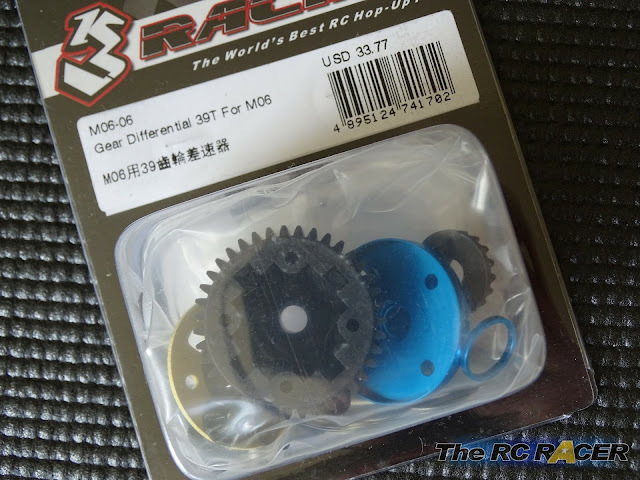 You want a steel or hardened 20t 0.6Mod pinion (Tamiya part no 53509) as the kit aluminium ones are soft and can wear and damage the spur gear. Importantly, do not put grease on the gears, this just causes drag, leave them dry and they will last for ages. 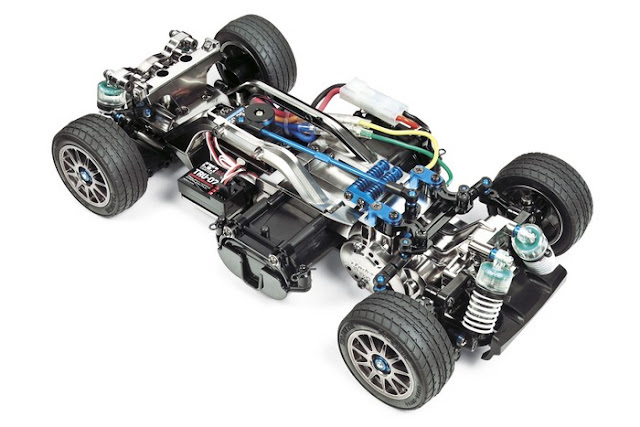 54277 Tamiya M-Chassis Reinforced Gear Set is a hop-up gear set, but it is not essential, if anything these gears initially sound a bit more coarse than the kit gears, although after a few race meetings they quieten down as they are worn in. I would only recommend these if you wear out your kit gears. It seems silly to say that these are a good hop-up, but they really help to ensure that the drive train is a free as possible with their smooth finish (Hence less friction in the drive train). They save quite a lot of weight (6g), this weight is high up in the chassis, so by fitting these you can transfer it to lower down to make the car handle better. So not essential, but cheap if you decide you want to add them. The differential makes the biggest difference in how your car will perform on the track. The kit diff when built to the instructions is very free and you will lose a lot of speed around the corners. It is also prone to diff out (Spinning the unloaded inside wheel) This can give the car some odd handling characteristics such as snap over-steer. Doing the opposite and locking the diff solid (A Spool) makes the car twitchy and hard to drive but can be fast on large, nontechnical circuits. So ideally you want a stiff diff that somewhere in the middle. All chassis come with a standard Tamiya bevel gear diff. These are not sealed so you cannot tune them with silicon oil, but you can use thick sticky grease. Tamiya's AW grease is very good for this purpose and a generous amount of this can give you a nice firm differential. However as it is spinning around is will move around a bit and the diff will become more loose over time so you will need to maintain it to keep it consistent. 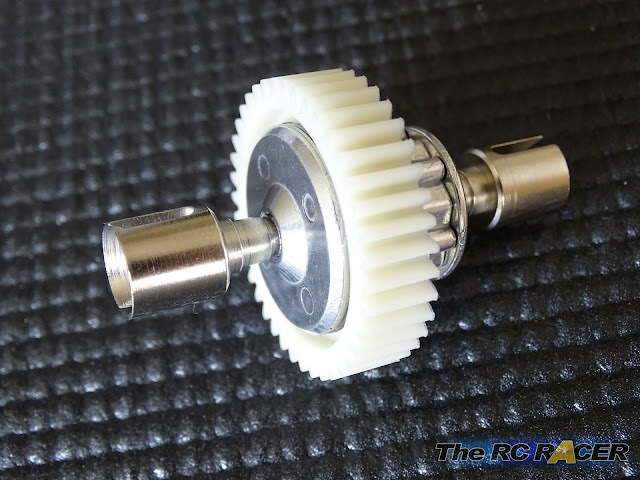 Another way to tuning the kit differential is to add some shims on the outside of the main bevel gears, this pushes the gears closer together and creates more friction. You do not want to use too many shims. (I used 0.6mm overall on mine), and also covered the gears with some AW grease and the diff performed well, although as you would expect it does feel quite notchy. A ball differential gives you much better fidelity when tuning the car, and there are a lot of options available for the M-Chassis cars. The Manta Ray / TA01 ball differential will fit. It is quite heavy but very tough. It is not able to be made as tight as the TA03 ball differential. This is still quite a heavy differential, but it is also very tough and can be left in the car for a long time between servicing. You have to take the chassis apart to adjust the stiffness, and you can make this diff very stiff (Taking care to not snap the screw). However I find the kit settings with just a little 1/4 twist more a good starting point. Over time the splines will wear out and you will need to replace them. When it is time buy the 53217 hard joint cup. When you fit it add a little AW grease on the splines for longer life. 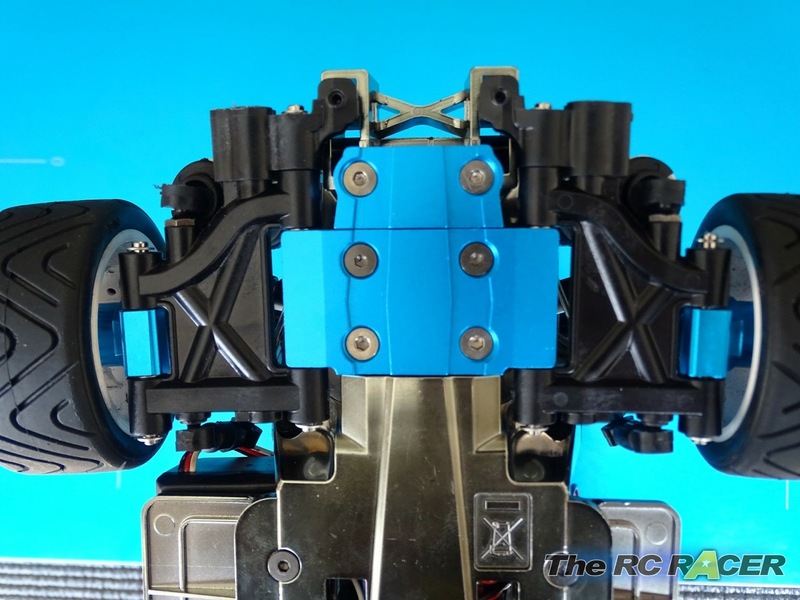 The latest ball differential for the M-Chassis cars, It is lightweight and very similar to the ball diffs that we had in the TRF416 cars. It is very smooth compared to the TA03 diff and it is 4g lighter. I like it a lot, however it is hard to make it as stiff as the TA03 diff, so ultimately the TA03 one might be a better choice if you want to run a stiffer diff. Some have upgraded the diff screw (Tamiya 51341) and thrust bearing (Tamiya 9949300) from the TRF cars to to make it more able to go tight. Although I would just go with either the TA03 diff or the following. The gear differential by 3 Racing always seems quite hard to find, and that is because it is very popular with people who race this class. The good thing about this differential is that you can set it very tight with some thick oil and it will stay consistently stiff with very little maintenance. Tuning the diff for your track is always subjective, I think that 30,000 is a good starting oil for my small track , although if racing on a larger outdoor track I would go much higher with 300k or maybe even 500k. Some drivers like to run a spool in the M-05. 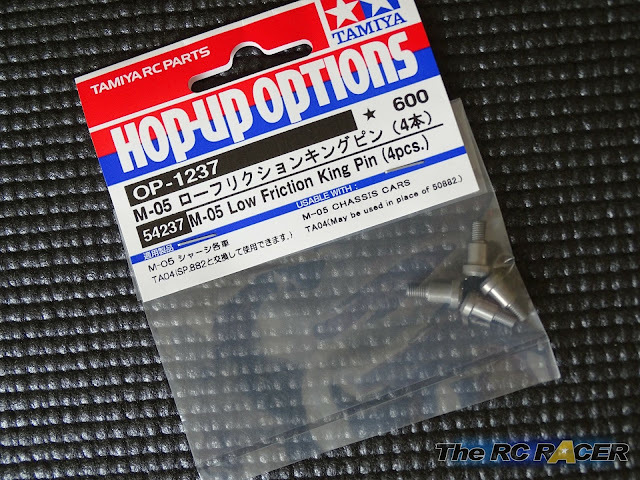 This is not the norm however, but if you wanted to try to run a spool Tamiya 54424 Bushings for Ball differential are a cheap option. 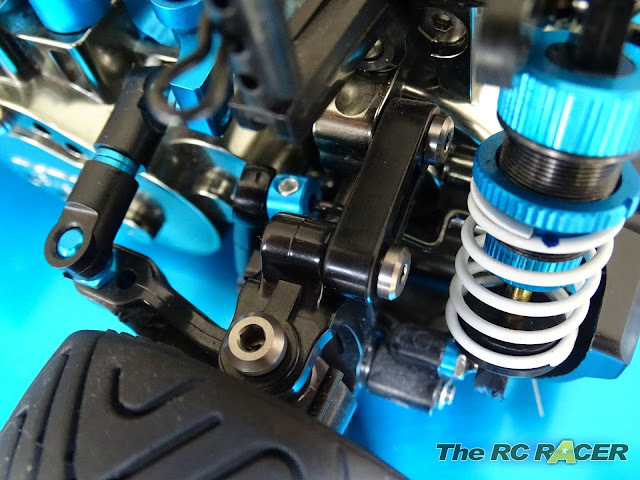 These replace the 3mm balls in the ball differential and gives you a spool action, but with the benefit that if the diff receives a strong enough shock then they will allow it to slip. These have been around for years, they work really well and they eliminate most of the chatter you will get when the front wheels are steering. A great upgrade. These are the latest and greatest. They are much more expensive than the standard universals. They do make a large difference however if you run a very stiff front differential as they will not chatter even when at full lock. Otherwise the standard universals are fine. Droop makes a big difference to how the M05 handles. If you have no droop the car will be a handful as the wheels will lift as the weight is moved around and the car will topple over without warning as there will be very little body roll. Too much droop will make the car feel lazy and you can still grip roll as you will have too much weight over the outer wheels when at the apex. The M05v2 has downstop screws like a normal TC so you can just adjust the screws to add or remove droop. The older M05 does not have this luxury, so you you need to adjust the droop with a combination of adding or removing shims on the internal shock shafts and unscrewing the bottom ball cup to change the shock length. 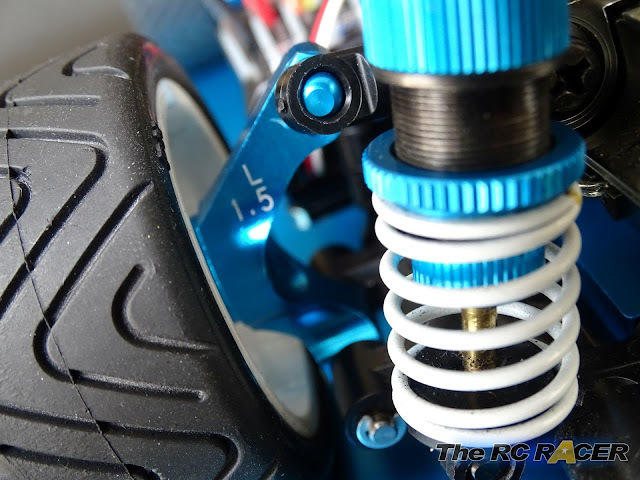 56.5mm shock length seems to be the preferred starting length to make shocks for the V1 M-05. To check droop, you want to look at both the front and the rear in turn. Lifting up the chassis and seeing how far you can lift it before the wheels lift off the surface. I start with 2m at the front and 3mm at the rear. When lifting the chassis it is essential that both the left and right wheels raise at the same time. Otherwise you will have something binding or have added incorrect spacers. When it comes to racing you need to get rid of the kit friction shocks and upgrade, there are lots of options available. Note if you have the V2 M05 do not build these shocks with any internal limiters, use the droop screws instead to have much more control. These are the cheapest option, and they work really well. They are light, strong and easy to assemble. 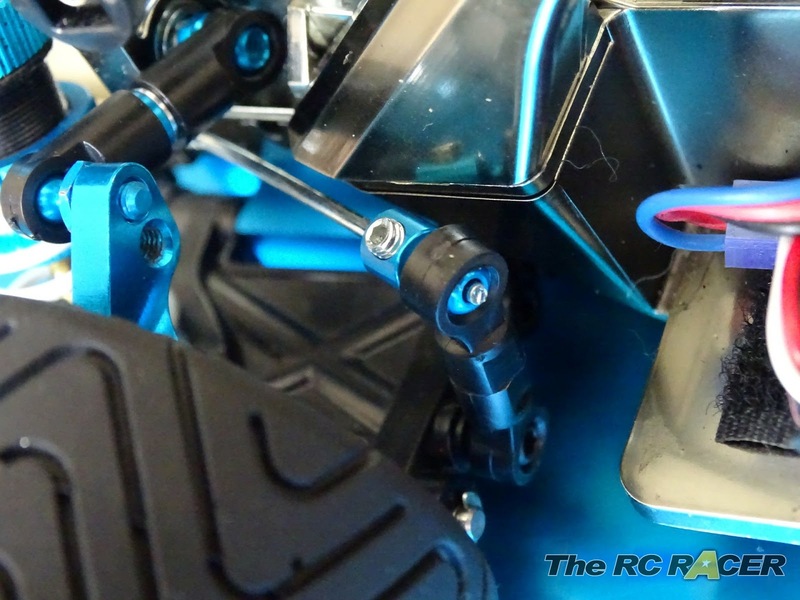 You want to ensure that you build the shocks with the 3 hole pistons. For a long time they were the best you could get. Although I would recommend you buy the later models nowadays. These are great shocks, and work much better with a M05V2. If you have the M05v2 then do not include the internal spacers when you build them so they are able to extend fully. Once you mount them to the chassis you can use the downstop screws to set the car to have 1mm of droop all around. These are the best you can get, they are the same size as the 42273 shocks but they have a bigger internal bore to carry more oil (10% more oil). Personally there is not much between these and the previous 42273 short shocks. As that has a larger cylinder so has more oil anyway. 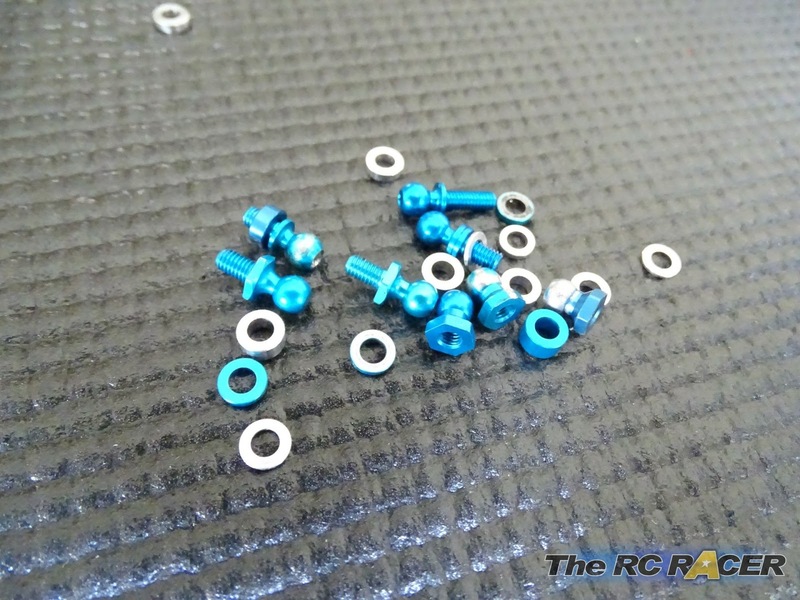 This is the most popular set for mini racers. A good starting combo is blue front and yellow on the rear, you can go to a harder rear spring if you want to add more steering and make the car more aggressive. On high grip carpet yellow front and read rear is a good starting point. It might seem strange for such a basic car but the sway bar set can really help the M05 feel more consistent in its handling, especially if you haven't got the car handling exactly how you want it. I like a go with a stiff rear stabiliser and the softest front one as a base setting. This eeks out a little more initial steering whilst still allowing the car to bite at the apex. 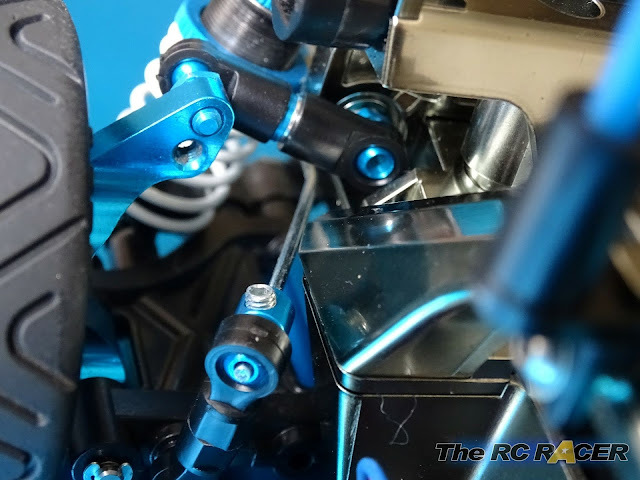 Carbon reinforced plastic arms replace the kit fibre reinforced ones. These are stiffer and they will give you a little more steering response on high grip carpet. You need two packets for the car as they only have one of each front and rear arm. These are a cheap part and I personally like them a lot as it removes the long screw pins. This saves weight on the suspension arms that in turn allows your car to be more reactive. They will also not come loose like step screws so I think they are a good little hop-up. These replace the outer hinge pin on the front suspension arms and give you a different lower shock position for the front of the M-05. On the 210mm wheelbase I prefer this option as it makes the front end really stable and the car feels much more planted on the rug. Outdoor I will remove it. Try to run the mini as low as you can, I like to have the front a little lower than the rear. For the track width, adding a 0.5mm or 1mm shim onto the wheel hex's can help a lot with the way the car handles. At the front of the car a wider front end will reduce the the grip a little and make the car less twitchy and less likely to roll. More narrow and the car will have more steering. A wider rear gives you more rear grip and better high speed steering, more narrow and you will have a high speed understeer but on the slower tighter corners you will have more rear grip. The stock M05 steering assembly is a bit poor if you want to ensure pinpoint steering accuracy to hit those apexes. Although there are a few quick wins that will give you much better results. The kit servo saver is not very good at all, replace it with this as it is much stiffer. 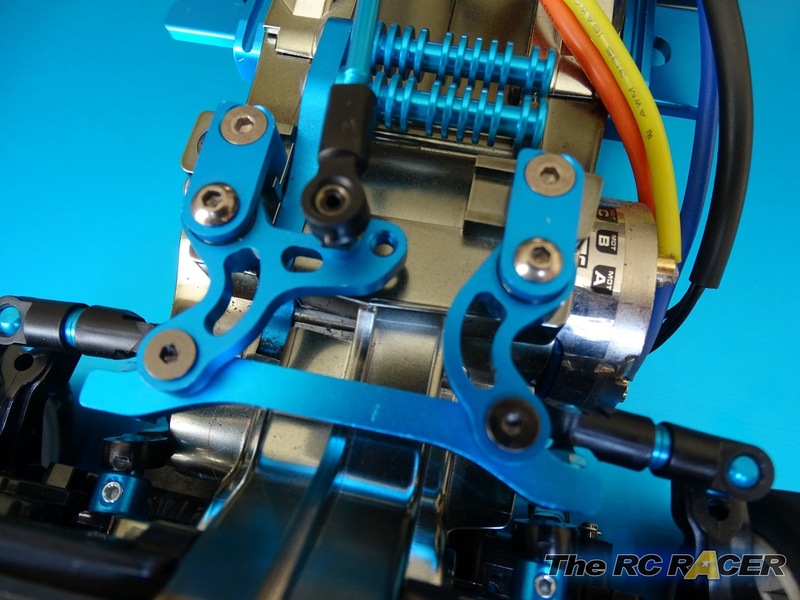 I also use the optional high torque aluminium servo arm (54121) for a little more stiffness and blue bling. These are the most essential upgrade for the car other than bearings. They fit the steering arms much better than the kit plastic ones adding much needed precision. Also the stiffer upper mounts do not warp like the plastic parts. These are not essential, but they are very smooth and also much harder than the kit plastic parts which will give you better precision. Again, this is not essential but like the steering set it is more rigid so that must help... right? Tamiya 54195 - Aluminium turnbuckle steering rod. 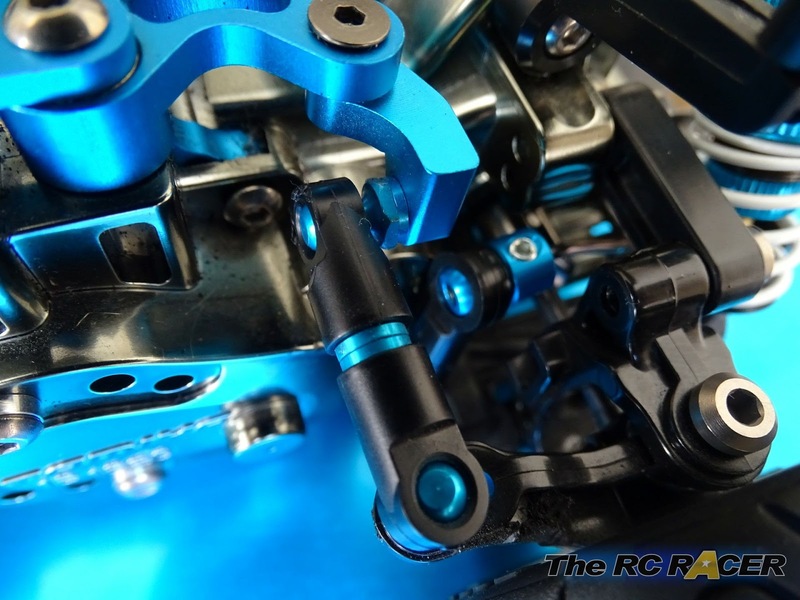 Not essential but it is convenient when setting up the steering with the car as you can just adjust the turnbuckle. Making the steering feel responsive on a M-05 is probably the biggest challenge. These king pins help give you the knowledge that your front hubs will have very little friction as they turn. These are no way a game changer, but they are cheap and you may as well buy these when replacing the kit parts. 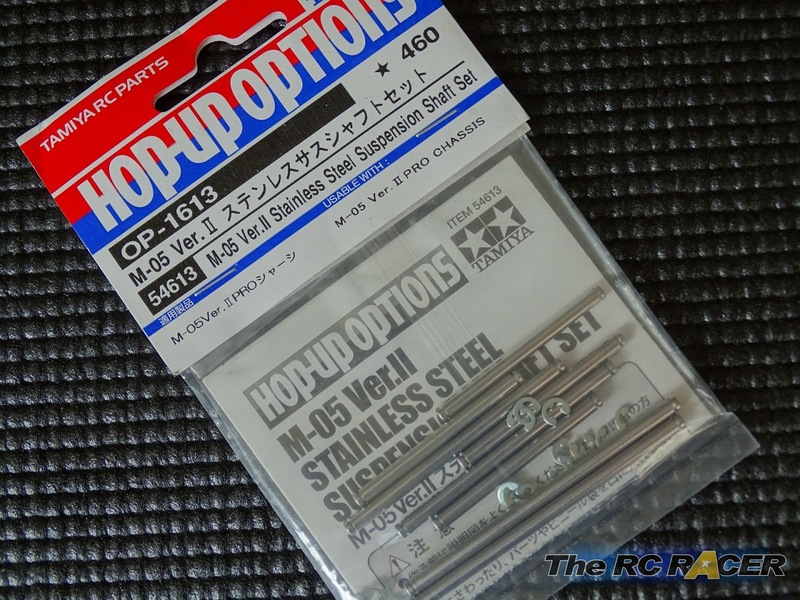 Unlike most cars the M05 has some very short arms so turnbuckles are not really any use. So you want to use threaded rod and shims to set the measurements. Use shims for your measurements on the arms, easy to see the settings and also still give you strength. Despite taking a bit longer to change settings, this method is nice and easy to adjust at the track. 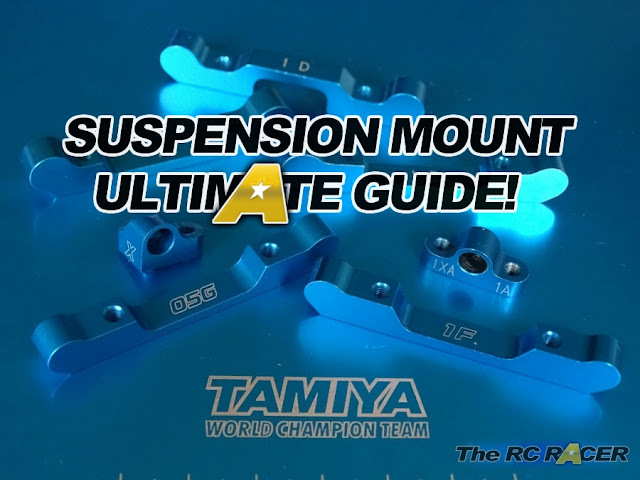 The Tamiya 53539 5.5mm aluminium spacer set will cover all of your needs. You must run toe out on your M-05 as it is a front wheel drive car as the drive train will always try to turn the front wheels in. Toe out does give you more initial steering but it actually gives you a little less steering at the apex. Lots of people forget to check the effect of bump steer on the front toe out settings. The M-05 can have some bump steer so you need to add spacers under the ball connector on the steering knuckles to reduce it. 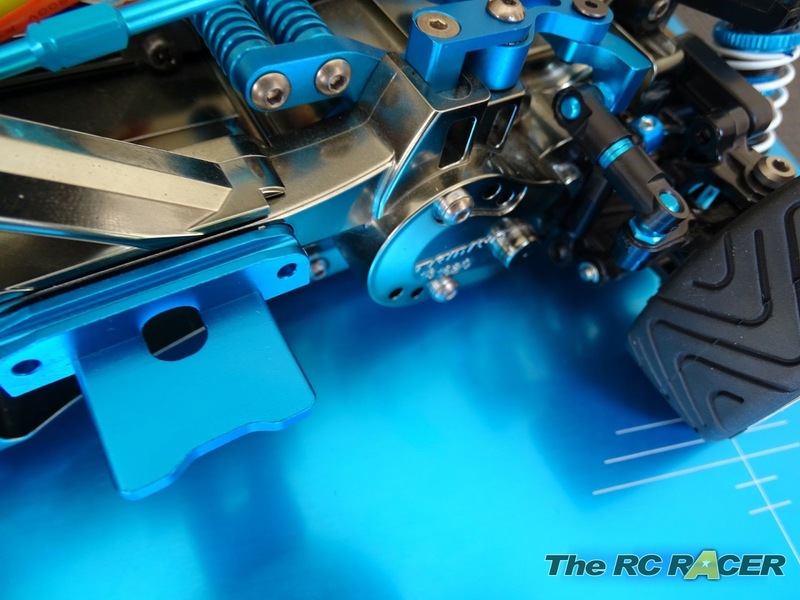 To check it you just need to set the ride height for your mini (4mm indoor, 6mm outdoor as a starting point). Then press down on the front of the chassis until it bottoms out. You will see the front wheels turning in a little, this is bump steer. 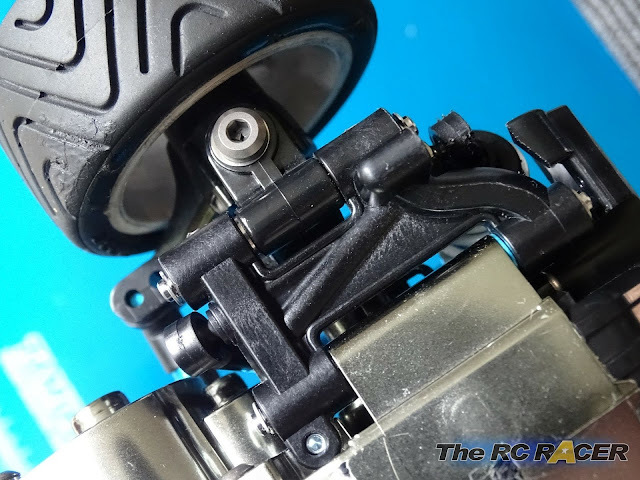 It is quite tricky to completely remove it, however you must really take time to add shims under the ball connector to stop the front wheels creating any toe-in. 2mm of shims seems to be a good amount to add on the stock hubs. The standard kit hubs are 2.0 degrees which is ok. However I think that 2.5 or 3 degrees really makes the M-05 run is With rear toe the more you have the more stable the rear of the M05 will be as it corners. The penalty you pay is that the larger the amount of rear toe-in the more drag you will have on the straight which will have some effect on your top speed. On the M05 you can change the rear hubs to have different toe-in. Tamiya and other manufacturers make a range of aluminium ones that you can swap with the kit hubs. I like the 1.5 degree ones (Tamiya 49442). These give you an alternative to the 2.0 degree plastic ones so you can swap between then if you want more or less rear toe-in. One of the best parts for the M05. This mount adds 1 degree more rear toe. Importantly it also adds a good bit of weight low down in the chassis. It is able to be configured for all 3 wheelbases and it is also a nice shiny blue. What more could you ask. 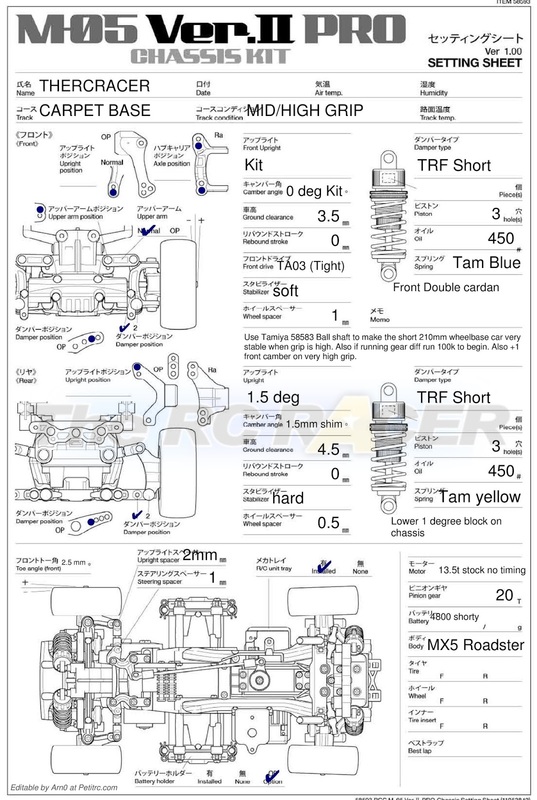 The standard front camber setting for the M-05 is 0.0 degrees. This is fine in most cases, although you can buy an adjustable upper arm set for the M-05 to change it. Swapping these out can give you -1 degrees (More front grip in corners) or +1 degrees which is surprisingly very good when running on a high grip carpet. As a rule I think thekit setting is fine in most cases. 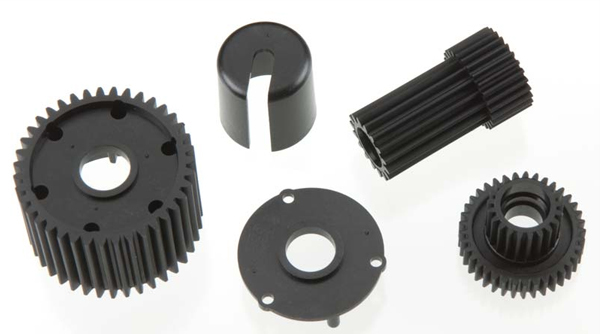 These are a refined version of the kit parts that are more precisely made reducing friction. These allow the upper arms to move smoothly. I just used one packet for the front upper arms as that is all you need. A cheap upgrade, but only worth buying if replacing the worn original parts. This is essential to have rear camber for your car, as unlike the front camber I find that the rear can be quite beneficial to change depending on the circuit etc. You use the shims to adjust the amount of rear camber that you have. For more rear grip I would use a 1mm spacer on longer wheelbase settings and 1.5mm on the short wheelbase as a starting point. Having raced onroad for decades I like to have a choice of upper suspension mount points to quickly adjust how the car feels in the corners. I run the carbon towers as they are strong and lightweight. Tamiya Front shock tower 54320 provides 3 upper shock mounting points. 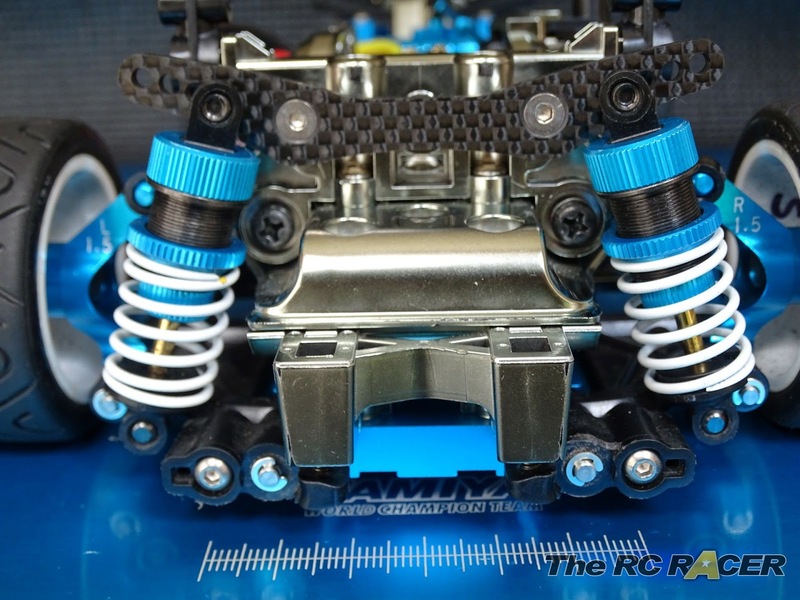 Tamiya 54475 carbon Rear tower provides 4 upper mounting points. The aluminium front shock tower (Tamiya 54236) is a popular alternative to the Carbon one as it adds weight to the front of the chassis. 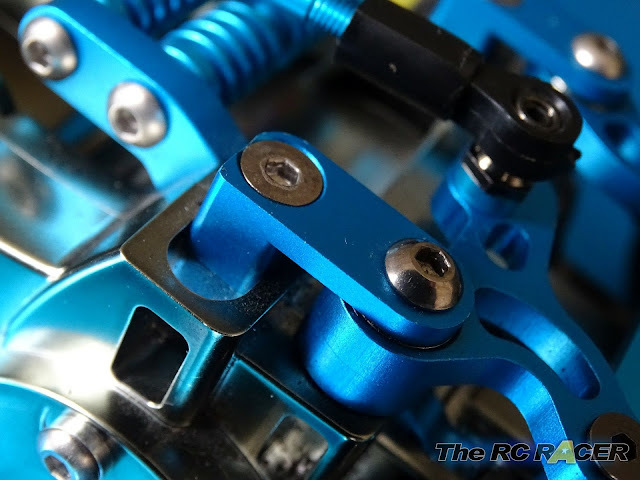 Moving the upper shock mounts more inward makes the spring feel more progressive so it starts a little softer as the body rolls. This will give you less initial bite into the corner but more grip will develop as you move into the corner at the apex and as you drive out of the corner. Moving out on the tower stiffens the spring a little. This gives you more steering initially but you will have less body roll which in turn moves less weight to the outer side as you enter the corner resulting in less grip on the apex and as you exit the corner. To make an easy to drive car, outer hole at the front and inner at the rear is a good start. Although when outside I like inner at the front and outer at the rear as usually the grip has a lot less bite. The M05 chassis works well when you pack in the weight nice and low. When starting out with the chassis it seems the more general weight that you add, the easier the car handles. However once you spend time with the car you realise that you can get away with less overall weight as long as you move the rest of the added weight lower down in the chassis where possible. The front bumper is a good place to add weight, 10-15g is a good amount there. Also look at adding it on the internal chassis under the servo or in the main frame (although moving it is a pain). The lower 1 degree block mentioned above is also a good way to add weight. I went a little over the top and added titanium screws to my car, although I would then swap some out with steel screws to move the weight where I wanted it to be. Another good area to reduce weight is the battery. Run a shorty lipo if you can and you will have centralised the weight. I used the Tamiya 54224 Lightweight battery holder. 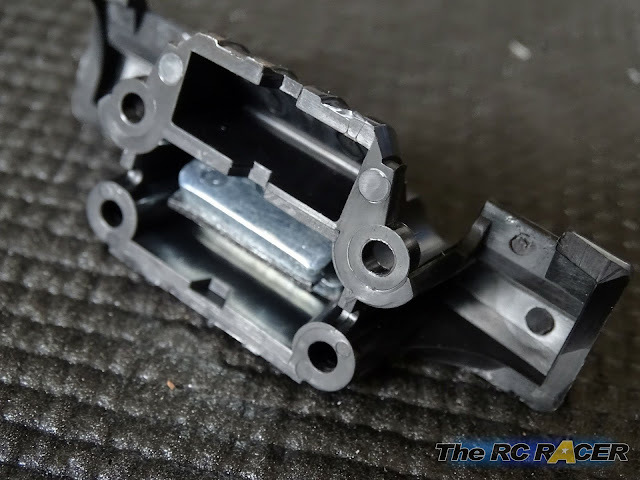 This is lighter than the plastic parts that you replace and it also allows you to easily tape in a shorty battery, and you can offset it a little for a good left/right weight balance. You can also lose the radio trays as you can mount the electrics on the side of the chassis, this can also reduce a little weight, Although on the short wheelbase I prefer them still attached (It benefits with more weight at the rear in my opinion). Hopefully the above gives you an insight into the options and possibilities available when running your M-05 chassis. 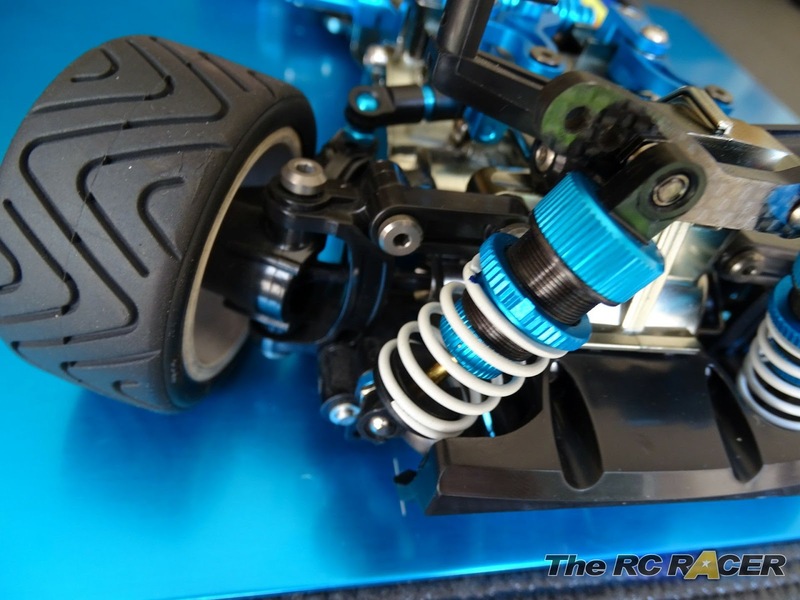 The M chassis class is a fun class that is limited by grip, so it is ideal for fun cheap racing. We have listed a lot of things here, but in reality though you just need to go for the medium wheelbase, fit bearings, oil shocks, steering posts and the correct tyres for your track and you will have loads of fun. I GOT A FIBER CARBON CHASSIS m05..........WHO MADE IT....? Awesome guide for the M05! Ask these setup concepts apply to other m chassis cars too. just bought an m05 with mazda 2 body. upgrades I am doing so far are bearings and motor mount. will be using a 5000mah nimh. will be keeping rest stock for now. so I am wondering do I need a steel or hard aluminum pinion? That is the cutest model I have ever seen. But for the real deal if you are facing some trouble, you can always take help from repair manuals online free Alfa Romeo.